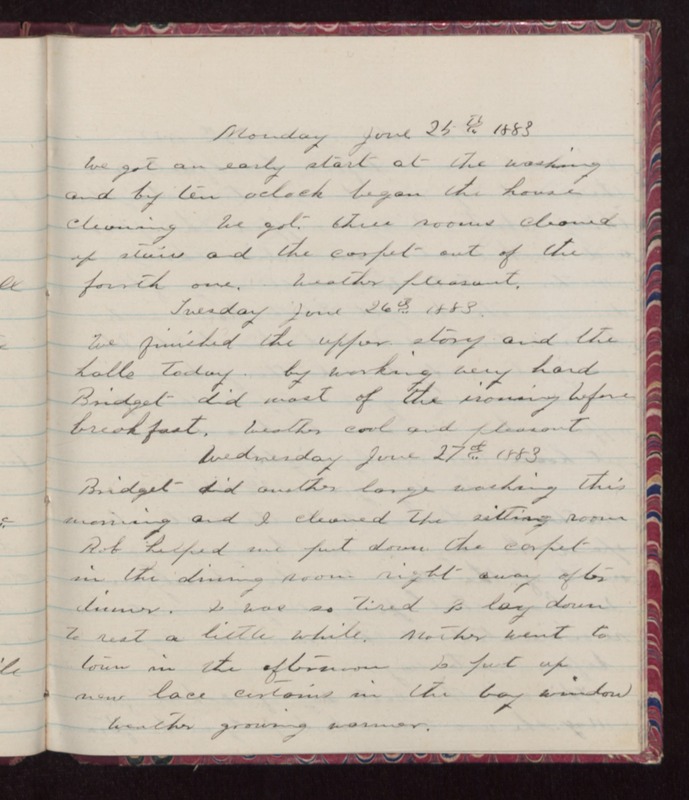 Monday June 25th 1883 We got an early start at the washing and by ten oclock began the house cleaning. We got three rooms cleaned up stairs and the carpet out of the fourth one. Weather pleasant. Tuesday June 26th 1883 We finished the upper story and the halls today, by working very hard Bridget did most of the ironing before breakfast. Weather cool and pleasant. Wednesday June 27th 1883 Bridget did another large washing this morning and I cleaned the sitting room Rob helped me put down the carpet in the dining room right away after dinner. I was so tired I lay down to rest a little while. Mother went to town in the afternoon. I put up new lace curtains in the bay window Weather growing warmer.